The first British consulate was established in New York in 1793. A century later its staff comprised consul-general, consul and two vice-consuls. Consuls-general leased their own residences and offices until 1945, when the British government bought a proprietary lease on Apartment 11/12B in 1 Beekman Place for the consul-general’s residence. It also bought, in 1956, a lease on Apartment 3 in 4 East 66th Street for the residence of the head of the then-UK Delegation to the United Nations. The two residences were swapped in the early 1980s because Beekman Place was closer to the UN building. The large East 66th Street apartment was sold in 2002. The address of the consular offices in 1929 was 44 Whitehall Street; in 1939 they were in the Cunard Building at 25 Broadway; in 1951 on the 61st floor of the Empire State Building; and in 1960 on the 7th floor of 99 Park Avenue (which they shared with the Delegation to the United Nations). In 1964, the consulate-general, the UK Mission to the United Nations and the British Information Services Office, moved to floors 9-11 and 19 of 845 Third Avenue. UKMIS and the Joint Management Office moved to 1 Dag Hammarskjold Plaza, 885 Second Avenue, in the early 1990s, leaving the consulate-general and the British Trade Office staying put. The first British consulate was established in San Francisco in 1851. After the Second World War, a consulate-general house, used as both residence and offices, was bought in 1946 at 2606 Pacific Avenue for $42,000. The Treasury made it a condition of purchase that the house should be sold as soon as the consul-general found a suitable flat to live in and while the market remained high. His successor had neither family nor furniture and in consequence found it easier to find a flat. The house was sold in 1948 for $38,000. It became apparent, however, that a permanent house was preferable to a leased apartment and 2516 Pacific Avenue was bought in 1954 from Samuel and Celeste Stewart for $82,000 (including its furniture). Adapting it to put the offices into the ground and basement floors and the residence into an apartment on the upper two floors cost a further £16,000. 2516 Pacific Avenue comprised two separate plots until 1920 when they were combined (and the former house on one of them was moved to 2504 Pacific Avenue) to provide a single large site. Here the prolific San Francisco architect Lewis Parsons Hobart (1873 – 1954) built a single house in 1921 for the Monteagle family on the foundations of the two former houses. It was in a restrained Tudor Revival manner, with a concrete frame and brick exterior. The Monteagle family sold the house to the Stewarts in 1948. Within a few years the offices in the house were found to be too small, and too far from the business centre of town, and they moved into leased commercial offices in the late-1950s. In 1960 the Foreign Office’s inspectors recommended the sale of 2516 Pacific Avenue on account of its being half-empty and, in an area designated for single-occupancy houses, the insertion of staff flats was forbidden. Subsequent searches for suitable properties to rent yielded nothing and the local British and pro-British communities began lobbying against the consul-general moving downmarket. Notwithstanding the Ministry of Works at high level and the ambassador informally agreeing that the house should be sold, it was re-arranged internally in the early-1960s to bring the residence reception rooms back down to the ground floor and use the whole house, except the closed-off basement, as the residence. This formation served well for the next thirty years, which saw extraordinary growth in trade between California and Britain: the residence, with its capacity for entertaining, was a notable hub of socialising and networking throughout these commercially explosive years. The main disadvantage of the house, as security tightened, was its lack of a garage but even this was overcome in the mid-1990s by carving a large garage out of the basement and forming a ramp down to it. Nevertheless, the house could not survive the reductions required by the estate modernisation programme of the early 2000s, despite strong support for it by the British commercial community in California. A somewhat smaller residence at 12 Presidio Terrace, Presidio Heights, was bought in 2004 for $4.8 million, and 2516 Pacific Avenue sold thereafter. From the mid-1950s, offices were successively at Alaska Commercial Building, 310 Sansome Street; 5th floor, Hong Kong Bank Building, 160 Sansome Street; 9th floor, Equitable Life Building, 120 Montgomery Street; 1 Sansome Street; and 8th floor, Citicorp Centre. 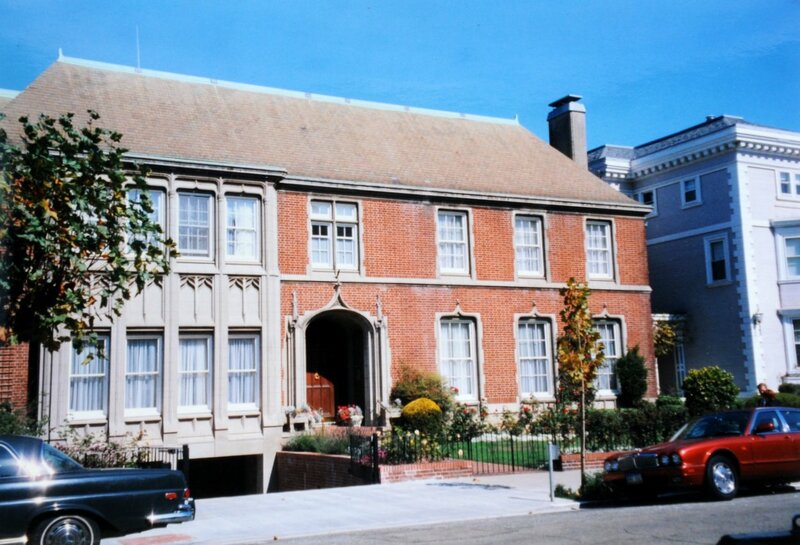 San Francisco: residence from 1954 – 2004, 1990s. The first British consulate was established in Chicago in 1855. The residence at Apartment 4, 1260 Astor Street, was taken on an 85 year lease in 1961. It was sold in 1988, after the consul-general’s move to a two-floor apartment on the 60th and 61st floors of the newly built Olympia Centre, at 161 Chicago Avenue East, bought in 1987. This purchase, together with the decision to enter the apartment at the upper level, was quite a striking departure from the norm. It was decided upon by the consul-general, Roger Carrick, whose previous post had been managing the FCO’s overseas estate, and his successor in that role, Mark Bertram, who was visiting Chicago. Apart from later problems caused by leakage from the ornamental fountain in the apartment above, this purchase has proved, and remains, a success. The offices have successively been at 39 South La Salle Street; 720 North Michigan Avenue; 13th floor, The Connecticut Mutual Life Building, 9th floor, 33 North Dearborn Street; 13th floor, South Tower, The Wrigley Building, 400-410 North Michigan Avenue; and 625 North Michigan Avenue. The first British consulate was established in Boston in 1817. The residence, at 15 Chestnut Street on Beacon Hill, was bought in 1972 for £80,000. It was designed by Charles Bulfinch, and built in 1805 as the middle of three houses that Hepzibah Swan built for her three daughters: it is now part of the Beacon Hill National Historic Landmark District. Since World War II, the offices have consecutively been at 10 Post Office Square; 2610, John Hancock Building, 200 Berkeley Street; 47th floor, Prudential Tower; 25th floor, Federal Reserve Plaza, 600 Atlantic Avenue; Suite 1500 1 Memorial Drive; and One Broadway.